An impressive performance in the second half was enough for Bayern to get the vital win on the road against Buducnost. 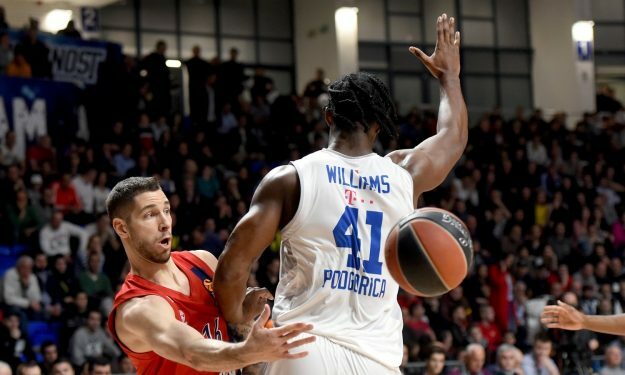 FC Bayern Munich managed to defeat Buducnost VOLI, 75 – 89 in Podgorica for Round 24 of the Turkish Airlines EuroLeague competition and made the playoff race even tighter, as four teams are fighting for two spots. Bayern improved to a solid 12-12 record. Despite the fact that the hosts build a comfortable eight-point lead in the first quarter (17-25), Buducnost responded perfectly with an 11-0 run in the second period and gained the lead (40-36). Edwin Jackson’s three-pointers sparked Budu’s run. Eventually after 20′, the score was 44-41. A 3-10 run by Bayern in the third quarter, however, was vital for the final result of the contest. For the first time in the game, Dejan Radonjic’s team went up by double-digits (51-61), controlling the tempo of the game. Since that point, and unlike the first half, Jasmin Repesa’s squad could not come back and challenge Bayern for the win. The lead even increased to 13 points in the fourth quarter (62-75). “In the beginning [first quarter] we played well. In the second quarter everything was different. They [Buducnost] played strong defense and changed the game. It was important at the half to understand that we cannot play like that in the second quarter. In the third quarter we played differently, starting from defense. We made some important shots and in the end we controlled the situation on the court”, said Bayern’s Montenegrin coach after the final buzzer. Vladimir Lucic with 18 points and seven rebounds led the way for the German team. Danilo Barthel added 16, while Derrick Williams finished with nine points and seven rebounds. For the hosts, Edwin Jackson scored a game-high 19 points (5/7 3FG).